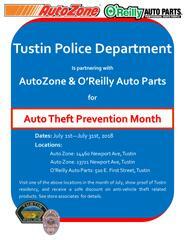 During the month of July, the Tustin Police Department is partnering with AutoZone and O’Reilly Auto Parts to combat vehicle theft in the City of Tustin. Starting July 1st and continuing to July 31st, you can visit either one of these businesses and receive a 10% discount on anti-theft related items. Vehicle theft, theft from unlocked vehicles, and theft of vehicle parts are three crimes that are common in Tustin. This is a good opportunity to purchase products, at a discount, to protect your property and help prevent these crimes from occurring. We invite you to stop into one of the AutoZone or O’Reilly Auto Part store locations in Tustin and see how they can assist you. The store locations are listed on the flier and the store associates are looking forward to assisting you.